All week I anxiously waited for Essie's new Fall 2011/12 colours to appear at French Pink, alas they were nowhere to be seen. The girls theorized the delay had something to do with HQ wanting to release the new colours once it was truly fall here. Once March rolled around, it would appear as through a switch was flipped and bang, smash, boom - fall has sucker punched us all in the face. To add insult to injury, last Saturday was the absolute antithesis to the weekend before that. We went from sunny and hot to cool and rainy; I've never seen people bundle up so quickly. People, Australia has nothing on cold weather extremes. It really is a walk in the park here, you just might need to carry an umbrella for showers not forecasted. I matched my nails to my funky mood - dark, stormy and a tad bent out of shape. I was coming off a roller coaster ride of a month; February really didn't happen in my book. 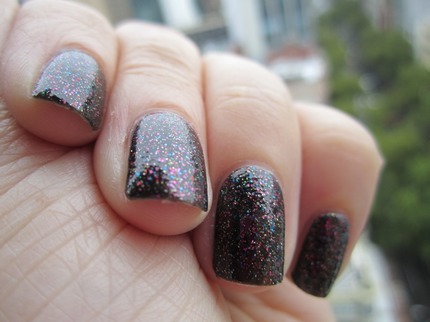 Butter London's The Black Knight was another new arrival I opted to go with. 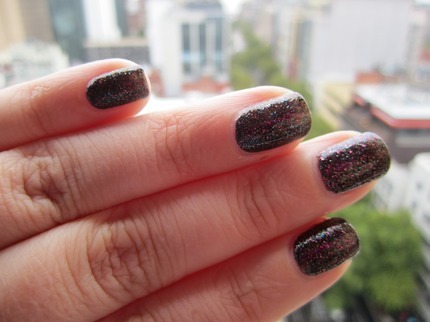 It's a semi-sheer black base with flecks of pink, blue, silver and black glitter. Janice painted on two coats and let me tell you she had a heck of a time getting it off today. Everytime I looked at my nails, I couldn't help but think of the packaging for Britney Spear's perfume Curious. I'd like to think she'd go for this edgy, but fun shade.